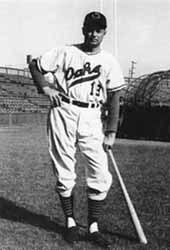 Born in Virginia, Allen "Two Gun" Gettel came to Oakland in 1949, after 13 years in minor league baseball and a 36-43 record in the majors. The 6' 3", 200 pound right hander is known for his slider and curve as well as a pretty good fast ball. He also toys with a knuckler. 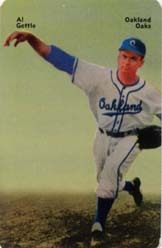 Al pitched 55 innings in 12 games for the Oaks in 1949, for a 4-0 record. In 1950, he pitched in 241 innings, both as a starter and reliever, in more than 53 games, and chalked up an impressive 23-7 record. He might even have done better were it not for missing six weeks after being spiked in the ankle. In 1951, Gettel was purchased by the New York Giants, where he pitched 30 games in relief, for a 1-2 record. He also pitched in 14 games for the Oaks that year, with a 5-4 record. 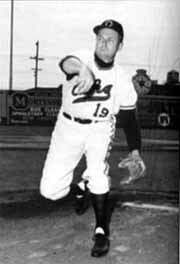 He spent all of the 1952 season in Oakland, pitching in 284 innings, with a 17-14 record and an ERA of 3.30. He hurled more innings than any other pitcher in the league in that and the next two seasons. 1953 was a great season for Allen. He led the league in wins (24-14), games started (38), complete games (30), and innings pitched (309). In May of the following year, he pitched a 21 inning game against the Hollywood Stars, hanging in for a 5-1 victory. He pitched in a league leading 284 innings that season, finishing 17-15, with a 3.07 ERA. He was 12-13 in late August of 1955, when he was sent to the St. Louis Cardinals. He got his nickname "Two Gun" because of his bit parts in Western movies during the off season. He has been known to arrive at the ballpark on opening night riding on a white horse with the Alameda County Sheriff's Posse, and waiving a 10 gallon hat. While pitching for Charlie Dressen, he was also known for his highly visible arguments with the umpires. When Augie Galan took over, Al toned down his gyrations. Although he had several chances in the majors, pitching primarily as a middle reliever, he prefers the PCL. Besides, being closer to Hollywood better serves his movie career.